Tonight the Chicago Bulls head down to Memphis, Tennessee to take on the Grizzlies at FedExForum. This will be Chicago's only visit to Beale Street, but tonight is the second time these two will have gotten together in a little over a week's time. In the first contest that took place on March 7th, the Bulls came out on top with a 119-110 at the United Center. Chicago's version of the “TimberBulls” sparkled that night, with rookie Lauri Markkanen leading the way with a team-high 22 points, followed by ex-Minnesotans Zach LaVine and Kris Dunn, each of whom notched 21. Bobby Portis also had a fine day at the office, posting a double-double with 15 points and 10 rebounds as the Bulls shot an impressive 42-of-79 (53.2%) from the field. The Bulls led throughout, posting a 30-22 edge after the opening 12 minutes, and then running out to a 64-51 advantage by halftime. 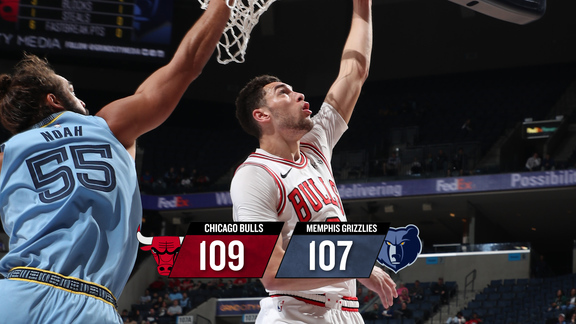 Chicago stretched its lead to 90-75 by the start of the fourth stanza, but Memphis rookie Dillon Brooks refused to go down quietly, scoring 20 of his game-high 29 points during the final quarter. At one point Brooks hit back-to-back 3-pointers to cut Chicago's lead to 94-93 halfway through the closing period, but eventually the Bulls got back into a groove, thundering their way to a 10-2 run, giving themselves a comfortable cushion that eventually allowed them to put the game away. Memphis takes to the home hardwood this evening with hopes of ending a brutal 18-game losing streak. However, their recent play doesn't provide much optimism. Currently the Grizz sport the NBA's worst record at 18-49. Over their last five games, on average, they're scoring just 93.4 points and losing by 18.0 points a game. The last time Memphis stepped onto the court they were thumped at home, this time by Milwaukee, 121-103, Monday night. The loss marked the Grizz's seventh straight home defeat. Marc Gasol led the team in scoring for the 22nd time, finishing with 17 points and seven rebounds, while Ben McLemore, Jarell Martin and rookie guard Dillion Brooks each added 16 points in the loss. This current 18-game losing streak is the longest the Grizzlies have experienced in Memphis. They previously called Vancouver home, and back in 1996 they established the all-time futility mark at 23-straight. Memphis' last win came on January 29th, a 120-109 victory over the Phoenix Suns. The Bulls also return to action coming off a disappointing home loss on Tuesday to the Los Angeles Clippers, 112-106. LA's DeAndre Jordan dominated the paint, scoring 29 points and snaring 18 rebounds, while veteran guard Lou Williams contributed 26 points in helping the Clippers sweep the season series. With three wins in their last seven games, Chicago's (23-44) problems have come primarily at the defensive end, as they've allowed 20 of their last 21 opponents to post 100 or more points, with the 21st reaching 99. In order for the Bulls to get back on track they're going to have to forget about Tuesday's loss and hit the floor tonight with a renewed sense of purpose. They have to storm out of the gates and quickly establish themselves as aggressors. The Bulls clearly have to turn it up a couple of notches defensively, going hard after every rebound and loose ball. As a collective unit they need to crash the boards — at both ends of the court —and look to run the floor at every opportunity in order to post easy scores before Memphis' defense has time to set up. Offensively the Bulls have to open up the floor, stationing shooters all along the 3-point arc to force Memphis to abandon the paint and cover a lot of ground. Chicago's playmakers, particularly point guards Kris Dunn and back up Cameron Payne, as well as starting wings Zach LaVine and David Nwaba, along with reserve Denzel Valentine, must establish a fast pace and look to take advantage of every opportunity to aggressively drive the ball hard to the rim. Chicago also has to keep turnovers in check while at the same time push the ball up the floor in a hurry and openly share it with each other by making it jump from player-to-player and hop from side-to-side. The Bulls' chief mission tonight is to hit the hardwood with a hard-nosed mindset and never back off. To create scoring opportunities, they have to get everyone involved in the action by generously distributing the ball. To that end, Chicago's bench also needs to contribute to the cause. Even in defeat against LA the other night, the Bulls reserves played a major role in keeping the game close as they outscored the Clippers backups, 43-24. It was the sixth straight time the bench has outscored the opponent. On the year Chicago's reserves rank ninth in the NBA is scoring (40.0) and sit tied for second in rebounding (18.7). Lastly, the Bulls simply need to play with an edge, and commit to outhustling Memphis in every way.